Not only will these projects update your home’s style, but they will also add value for any future buyers. These projects make an impact on their own or in combination with other home renovation projects. Kitchens are the center of most homes. They’re a communal area where you can gather with friends and family for different holidays and events. This room also happens to be one of the most valuable and a selling point in many cases. You don’t have to completely remodel your kitchen to add some major value. Small updates to your kitchen make a big difference. Kitchen counters are a defining feature of any kitchen. Between regular wall counters and central islands, these surfaces are the most used and visible in your kitchen. There has to be enough surface area for all of your countertop appliances and regular food prep and eating. Many older homes feature dated laminate counters. This ages your kitchen and can bring down its value in the selling process. There are a few ways to update these old boring counters. You can paint your laminate counters for a completely different aesthetic. You’ll want to be sure that your surface is properly cleaned. Kitchen counters tend to have more built up residue than other home surfaces. 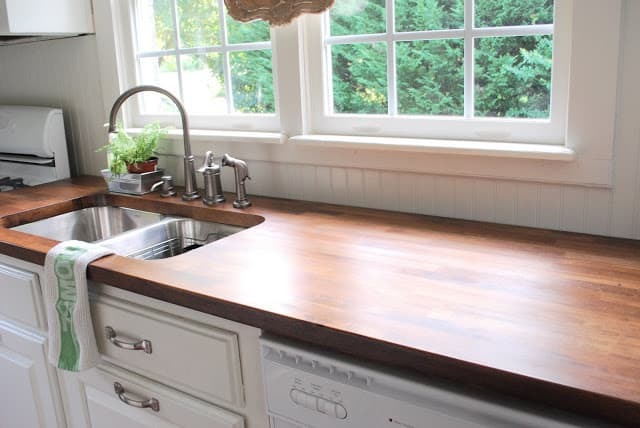 A black primer should be applied to your newly cleaned countertops. This black will show through the layers of color that you sponge onto the counter in layers. This creates a granite like finish on your counter. Once you’ve allowed your countertops to dry completely, lightly sand the surface to even out any buildup of paint and apply a clear topcoat to seal the counter. This simple upgrade updates your kitchen design and adds to the value of your home. You can also just fit a new countertop over your current surfaces. Depending on the home décor style you want to feature in your kitchen, you can use different materials for your kitchen counters. One of the most popular counter materials is butcher block. While it’s usually featured in farmhouse renovations, butcher block counters fit well into any traditional home design. It coordinates with almost any color cabinet and comes in a wide range of wood tones. For a more modern kitchen counter, you can use soapstone. This dark natural stone can fit into rustic or modern kitchens because of its marbled appearance. It comes in a variety of colors that range from all white counters to a dark charcoal color. If you don’t want to go through a complete replacement of your existing counter, you can create a shell from your materials that fits over your existing countertop. These update your kitchen’s design at a fraction of the price. If your kitchen counters are the most visible surface in the room, your cabinets are a very close second. They take up the majority of your kitchen wall space, and can be more defining than your paint color. Kitchens need ample storage space and it takes form in different ways all over your kitchen. From cabinets, to drawers, to pantries, there are a million ways to store food and appliances around your kitchen. One of the easiest ways to update your cabinetry is to simply replace the hardware. You can mix and match different knobs and drawer pulls to create a custom look and update the aesthetic of your cabinets in the span of one afternoon. For a bigger change, you can change your cabinets color. You can use a new stain to pull out different wood tones or simply paint over the existing cabinets with a fresh new color. If you plan to sell, void any colors that might put buyers off from buying your home in the future. One major change that won’t break your budget is to replace your kitchen cabinets with open shelving. This is a trendy home design idea that can keep your space feeling larger and brighter. If you like the idea of open shelving, but aren’t ready to let go of your cabinets yet, replace your cabinet doors with glass panels. It has the same illusion as open shelving, but they are still protected. The last aesthetic update to your cabinets is to use crown molding for a custom built in look. If you have an open space between the top of your cabinets and your kitchen’s ceiling, the addition of crown molding can add elegance while keeping your home decorating on a budget. Just like the kitchen, bathrooms are going to be a major selling point in your home should you decide to it on the market. 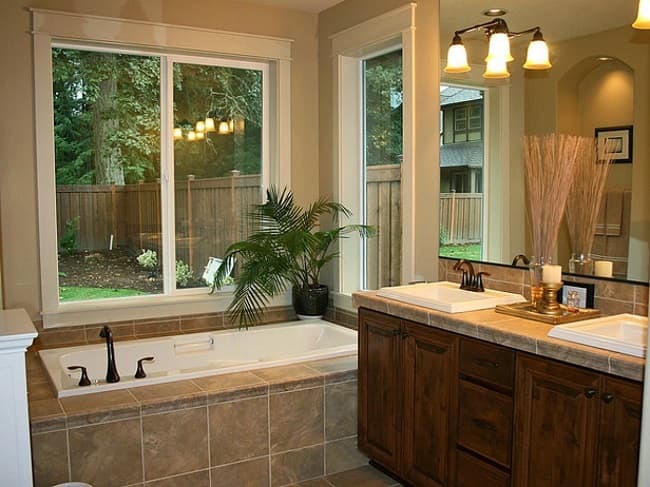 Many people want the idea of luxury at the forefront of their bathroom’s design. Luxury also typically follows custom designs and expensive house upgrades. This doesn’t have to be the case! By updating smaller aspects of your bathroom design, you can create major changes in the design and add value to your home. Tile is probably the most prominent material used in your bathroom. Just because you don’t want to strip and relay new tiles doesn’t mean that you’re locked into the old design. There are a few ways that you can update your existing tiles to make your bathroom look new and add value to your home. A very simple way to make your bathroom look brand new is to recaulk your bathroom tiles. This may seem like a simple upkeep project, but new caulk can make an entire bathroom look new and updated. The most important places to check first are any tiled areas that are most often wet. This includes the edges of a shower, the walls around your bathtub, and the floor just outside of your shower or bathtub. Removing caulk is a relatively simple process using a putty knife or a razor blade depending upon how much caulk you are removing. If you want to expedite the process even further, there are several different caulk softeners on the market. The most important thing is to remove all of the old caulk from the tiles. While new caulk can blend with the old, this isn’t always the case. After the caulk is removed, make sure all residue is removed from the tiles. Just like cleaning the surface of your deck, a bare surface ensures that the new caulk can adhere to your tiles. Be sure to apply the caulk evenly and at a steady pace. After you have recaulked all of the necessary areas, clean any extra caulk from the edges of your tiles and smooth and large lumps of caulk from the lines. You aren’t limited to a standard white caulk either. If you have light colored tiles, black bathroom caulk can create a contrast and add interest to your bathroom floor and walls. If you want to keep a classic white caulk, but still want the contrast, painting you existing tiles is a great option. Painting ceramic tiles is a budget friendly alternative to replacing all of the tile in to your bathroom which can quickly become pricey. While cleaning the tiles thoroughly is an expected preparation step, you must also lightly sand the tile to remove the glossy finish and uncover the tile’s surface for the paint to adhere to. An orbital sander is going to be the much faster option, but hand sanding is another possibility. After you’ve wiped down the tiles and removed any excess dust, you have two options for painting tiles. A latex paint will require one or two coats of a primer that is made specifically for surfaces like tile. The other option is to use an epoxy paint that is made up of two parts. There are specific epoxy paints that are made for tiled surfaces. These paints don’t require a primer, but your color choices may be more limited than the latex paint options. There are simple house upgrades that you can make to your bathroom fixtures without having to completely replace them. By updating the furnishings in the bathroom with easy weekend projects, you can make your entire bathroom look brand new with no major renovation required. One of the most popular DIY projects is to paint old fixtures and knobs to create a new look in your bathroom. This can include everything from sink hardware to shower heads. One of the most important parts of your preparation to paint plumbing fixtures is to ensure that there is no extra moisture. If you can, avoid using the sink, bathtub, or shower in question for a day or two. Just like the tile, you’ll want to sand the fixtures really well to create a surface that the paint can adhere to. Tape around your fixtures and make sure that a plastic drop cloth is completely taped down around the painting area. Having paint splatters around the new fixtures will take away any value that you added with the upgrade! A primer will be needed to ensure that your paint job on the fixtures will last long term in spaces with excess moisture. After the primer has completely dried, you can spray paint the fixtures to fit into your new bathroom design. After a few coats, you can finish your fixtures with one or two coats of a high gloss finish. Be sure to wait between each coat of primer, paint, or finish to be completely dry before applying the next coat. One of the simple house upgrades that can add major value to your home is to upgrade your staircase. This single piece of your home design can help update your home design style. If you have a traditional staircase, you can update it by adding to the steps themselves. Painting or refinishing wooden stairs is a common weekend project for homeowners. You can create a cleaner design than a typical dated traditional stair. For a more unique paint job on your stairs, you can paint your own runner down the staircase. This takes the place of a traditional carpet runner than can be a tripping hazard and also look old. If you have a traditional staircase and want to upgrade your home’s style further than a simple paint job, consider installing a spiral stair. The unique design can enhance your home’s design and create more space. A spiral stair’s footprint is much smaller than a traditional stair and can easily be tucked into the corner of your existing floor plan. The size of your staircase depends on the diameter or width of the stair. It can be small enough that it’s a small circle in the corner or wide enough that it’s a grand centerpiece in your home. The same flexibility applies to the design of the stair itself. 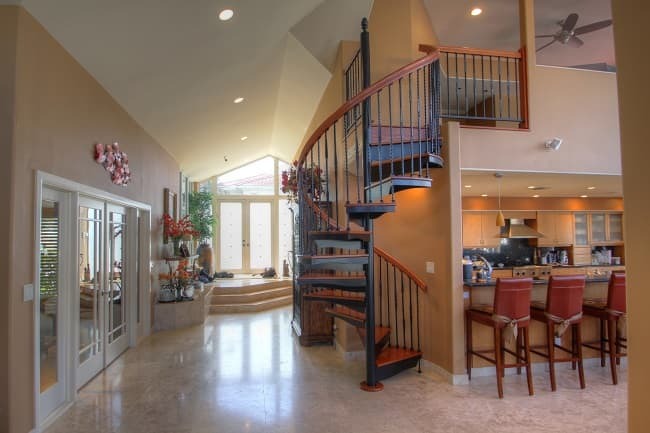 There are three types of spiral stairs that are typically used indoors: Forged Iron, Classic Steel, and Solid Wood. The Forged Iron stairs are defined by their ornate details that fit well into a traditional or Victorian home design. The addition of wood treads adds an element of elegance to your spiral stair. Classic Steel spiral stairs are by the far the most versatile of the interior spiral stair choices. You can achieve a custom color with a powder coated finish to create a one of a kind design. You can design a spiral stair that fits into both a traditional and industrial home design depending upon what kind of tread covers you decide on. If you want to design a truly rustic stair, an All Wood spiral stair is the best fit for your home. It holds all of the charm and traditional of an all wood design, while giving you the unique design of a spiral stair. If you want to update an existing spiral stair, replacing a spiral stair is easier than you think. Installation is an easy weekend project that can be completed with the help of a spouse, friend, or neighbor. You don't have to completely redesign your home's interior to add major value to it. Small updates can go a long way when it comes to home design. You have the option of doing one of these updates or all of them! They are small enough to be conveniently completed in a weekend and have flexibility of design to be customized to your home.